Fine dining here is definitely enjoyable and make you feel warm and welcome by the friendly staffs and manager. The seats are very comfortable and restaurant is cooling as well. 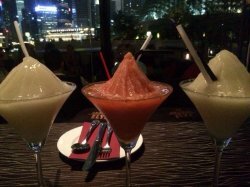 Have bought their Watermelon with Rose salt fresh margaritas (with alcoholic) and really love the icy icy feel and the fresh watermelon flavour is refreshing and appetizing. Alcohol is not that strong and suitable for me. 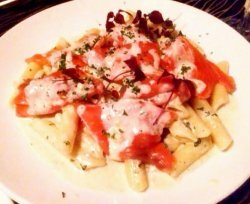 Penne, which is cooked with lots of thinnly sliced smoked salmon, that are chewy and fresh. Penne is not too soggy and filled with generous amount of butter cream and some vodka as well. Paid nearly $60 for this meal but is worth the money.